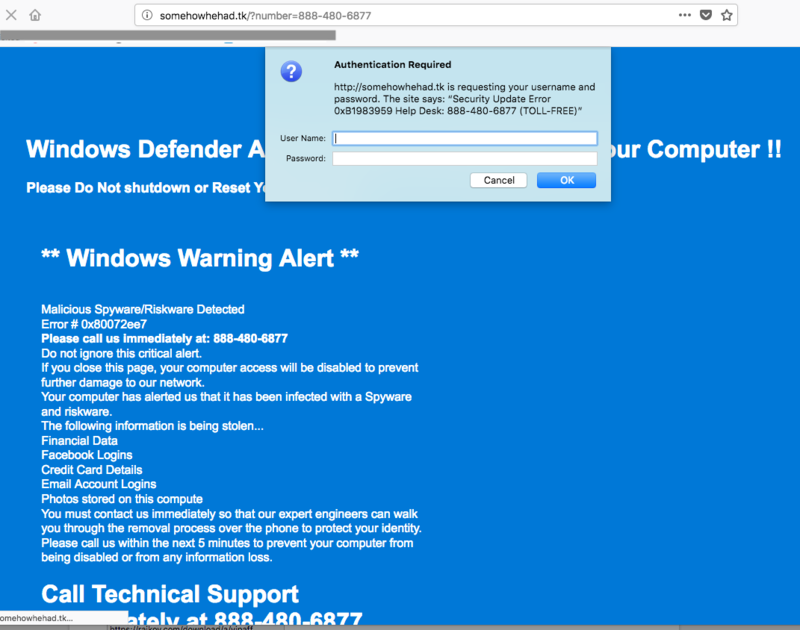 Mr. Woody Leonhard and the good people at Windows Secrets published the article below about Microsoft’s effort to combat “tech support scams.” Windows Secrets gave us permission to re-post the article and we thank them! If you have a Windows-based computer, we recommend their newsletter! A woman sent us this voice message which she received about her Windows license key. Of course, she didn’t even have any Microsoft products on her computer so knew it was a scam! “Your Microsoft Windows License key has expired in your computer.” You are asked to call 866-978-5387. A Google search for 866-978-5387 shows links to many sites where people are describing this scam, including 800notes.com and Scammer.info. We visited a webpage that was hacked and were suddenly hijacked and redirected to this web page being hosted on a server in Turkey (“.tk” is the 2-letter country code for Turkey) telling us we have a virus on our computer and to call their “Help Desk” number: 888-480-6877. That’s help we don’t need! If you read the message in their popup, it’s ridiculous, especially since we were on an Apple computer at the time. 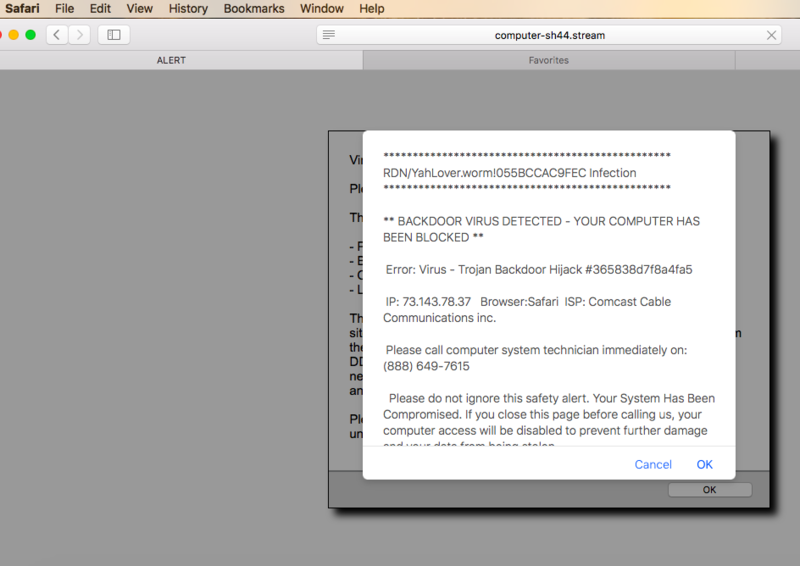 One of our readers contacted us have getting the message you see below in Safari on her Mac. This trick is intended to scare her into calling the phone number 888-649-7615. DO NOT CALL THIS NUMBER! The paragraph at the bottom of the message is a bunch of BS. Our reader was re-directed from a hacked website to the domain “computer-sh44-DOT-stream.” This domain was registered on December 15 using a private proxy service in Panama. The website description is “Google.” Like that’s believable. UPDATE 2/1/16: Listen to this recording of a scam caller pretending to be from Microsoft Tech Support posted by a Reddit user. Study finds Tech Support scammers preying on Young Americans –From NakedSecurity.com. On March 28, 2018, the FBI put out this warning about Tech Support Scams. Apparently, more they received more than 11,000 complaints in 2017 about these scams, resulting in millions of dollars in losses to consumers. In late December 2014, Microsoft filed a lawsuit against a U.S.-based company that’s been accused of massive tech-support fraud. If you’ve been the victim of a phony “tech support” call — or you know someone who has — it might be payback time. If you let the bogus support person into your machine, he’ll soon “discover” dozens of “serious infections” and other “critical problems” that need to be fixed immediately. All you have to do is hand over your credit card to make your system right. If you’re lucky, the support person will have pretended to fix the “problems” and you’ll only be somewhat poorer for the experience. If you’re a bit less lucky, your PC will be in slightly worse shape than it was. In the worst cases, the bogus support person will leave malware behind, just as a thank-you. Although tech-support scams have been around for many years, Microsoft’s lawsuit represents a new tactic. Typically, the company would have worked with both law enforcement and the courts, for example, to take down malware servers (and some legitimate servers, as reported in a Tom’s Guide story). But in this case, Microsoft is taking the more direct and immediate action of suing a company providing allegedly bogus MS support. In my opinion, it’s about time — I wish them overwhelming success. Aiding and abetting bogus tech-support creds? That Microsoft is trying to stop bogus tech support is obviously a good thing. But some of its own terminology might be contributing to the problem. Unfortunately, titles such as “technical-support professional” or “tech-support provider” are used by both scammers and genuine support persons. There’s nothing deceptive about these descriptions: there’s no legal definition of a “tech-support professional,” no national accreditation that uses that specific terminology — that I’m aware of. Adding “Microsoft” to the mix makes things somewhat murkier. For example, the title “Microsoft tech-support professional” is still relatively generic; it could apply to anyone who supports Microsoft products. Heck, most Windows Secrets readers probably feel from time to time like professional tech support for Microsoft. Even “Microsoft employee” can be confusing. There are many contract support techs who work for Microsoft but aren’t, technically, Microsoft employees. Want to see for yourself? Go to the Microsoft Partner Network homepage and click the Join Now button in the right-hand column. Sign in with any Microsoft account (the site calls it a “Windows Live ID”), fill out the on-screen form, and click the Submit box. You’ll probably be granted immediate membership — as I was (see Figure 1). Figure 1. You can become a member of the Microsoft Partner Network in two minutes or less. My “company” was made a Microsoft Partner Network member immediately, eligible to sell Microsoft Online Services (see Figure 2). Figure 2. Once you’re an MPN member, you can advertise that fact anywhere — and sell Microsoft Online Services, if you wish. I’m amazed by the number of tech support–scam stories that make no mention of how easily scammers can advertise themselves as Microsoft Partner Network members. It’s important to note here that being in the Microsoft Partner Network is very different from being a Microsoft Certified Partner, as Brian Krebs explained in his November blog post. But it’s a sure bet only one PC user in a thousand knows the difference; more likely, it’s one in a hundred thousand. But it’s clear that Microsoft itself has — inadvertently — helped the scammers. That’s a slap on the wrist, given Microsoft’s claim that scams result in losses of $1.5 billion a year. Another trend is even more serious. Although Microsoft, the FTC, and other authorities from many different countries have tried for years to crack down on tech-support scams, the problem is getting only worse — especially as the already large, worldwide pool of English-speaking, PC-literate, but poorly paid workers continues to expand. Ask if there is a fee or subscription associated with the ‘service.’ If there is, hang up. Everyone who uses a Microsoft product should know that Microsoft never calls to provide technical support — unless you’ve specifically requested a callback and you have a callback number. Have you been scammed or think you might have a scammer on the phone? A Microsoft page tells you how to report it. For more information on working with Microsoft Tech Support, see Susan Bradley’s April 3, 2013, On Security story, “Working with the real Microsoft Support” (paid content).